When running mechanical position or limiter brake failure, Due to inertia, A Overhead Crane or trolley that runs to the finish line, in the operation of end point collision with set up a blocking body. The purpose of setting buffer is absorbed a Overhead Crane or lifting trolley running function, to slow down the impact. The buffer is arranged in the position that the Overhead Crane or the lifting trolley collides with the blocking body. Between running on the same track Overhead Crane and double trolley in the same bridge should also set the buffer. The rubber buffer: The buffer structure is simple, but it can absorb less energy, commonly used in Overhead Crane running speed is not more than 50 / min, Play a major blocking role. Polyurethane buffer: Polyurethane foam energy absorption buffer, buffer performance, oil resistance, aging resistance, acid resistance, corrosion resistance, high and low temperature resistant, insulating and explosion-proof, the relative density of light, simple structure, low price, no noise, no spark, convenient installation and maintenance, long service life etc. So has been widely used in the world, on the general Overhead Crane, alternative rubber and spring buffers, more worthy of popularization in explosion-proof places. Spring damper is mainly composed of meet, springs and shell. Its characteristic is mechanism simple, reliable use. 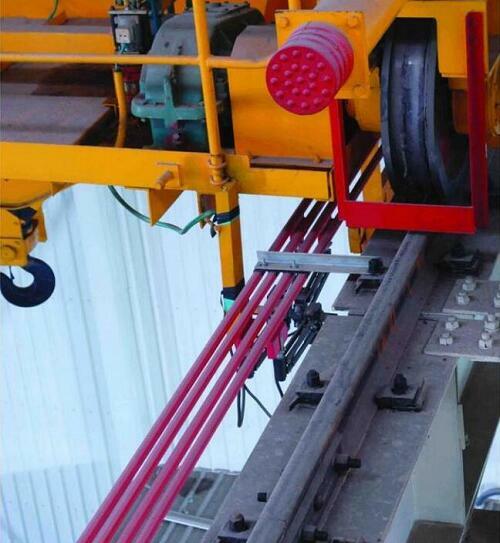 When the Overhead Crane hit the spring buffer, the main energy is transformed into the spring compression. Spring buffer with improved stop mechanism, can prevent a rebound. When buffer by collision, kinetic energy by the plug head and accelerate the spring to the pistons, the movement to the right. The original buffer work chamber is equipped with a reset spring, plunger, and the oil. The movement of the piston extrusion working chamber of the oil, The movement of the piston extrusion working chamber of the oil, the reset spring compression. At the same time, the oil ring gap between the piston and the push rod squeeze out, Enter the oil storage cavity. When the piston moves, because of the large annular gap between the oil and the push rod, easy to be squeezed out; In piston continue to exercise, the annular space are getting smaller and smaller, the piston resistance increasing, to stem the cylindrical phase, annular clearance for difficult can tell, resistance is stable to the maximum. As the piston continues to move, the annular gap becomes smaller and smaller.